Shay Olivarria is a motivational speaker, financial literacy coach, former foster care youth and author of 10 Things College Students Need to Know About Money and Money Matters: The Get It Done in 1 Minute Workbook. As an ambassador for financial freedom, Shay travels all over the country to educate people on responsible financial decisions. Shay’s passion for motivational coaching was ignited seven years ago when she began outreach efforts for the San Diego Community College District. She advised students on the college process and has continued to reach out to youth on a number of levels. Shay is dedicated to community activism and specializes in mentoring gang-involved and at-risk youth, and has been able to channel her life experience into her professional and entrepreneurial efforts. Shay explains, “Aging out of foster care made it clear to me that I need to take responsibility for my financial future. I started reading books, attending seminars, and piecing as much information as I could together. After working with students in truancy and mentoring programs, it became apparent that these kids needed the same help I needed.” We interviewed Shay for this edition and here are her responses on life and her company, Bigger than Your Block. I live by this motto because so many people don’t realize that there is so much to see and experience beyond where they live. I teach personal finance because I believe that once you are making good decisions about your money you’ll want to travel and seeing the plight of others, whether domestically or internationally, will encourage you to start helping others. Each one can teach one once we understand this basic concept. My company, Bigger Than Your Block, delivers trainings, workshops, and speeches around personal finance and motivation. I travel the US helping people make small changes that make a big difference. Events are based on my two books, 10 Things College Students Need to Know About Money and Money Matters: The Get It Done in 1 Minute Workbook. I’m based out of Los Angeles, CA. Videos, testimonials, and more information about my work can be found online at www.BiggerThanYourBlock.com. I had been working with youth for over ten years from California to Pennsylvania by the time I started Bigger Than Your Block. Whether the students were involved with an afterschool program or a truancy program, they all wanted to know about personal finance. I always included personal finance tips in addition to the required curriculum when I realized that I could be paid to do exactly what I was already doing. You can hear something a thousand times, but it may take someone saying it a specific way for you to really hear it. I know there are hundreds of folks talking about personal finance, but I’m talking about it from the perspective of a person that wants to know what they need to know so they can start making their money work for them. Helping the average person understand personal finance is what motivated me. Folks didn’t know that money management could be so simple. The biggest fear that I had was about my background. I didn’t think that people would listen to a chubby, little brown girl that grew up in the hood. Even though I’ve traveled the world, earned an undergraduate degree, and studied for my masters, I still see myself as that little kid with the goofy smile and the crazy family. Why would anyone listen to me? I had to realize that no one is perfect and I just may be the perfect person for some folks to hear. You can’t imagine how good it feels to have other people with a sordid background look at the covers of my books, listen to my words, and then come up to me and tell me how thankful they are that I’m doing this work. Some say it’s the way I say things. Sometimes it’s the fact that I’m a brown woman that’s building something awesome. Sometimes it’s the way I’ll stop in the middle of a speech to respond to someone in the crowd. I had to realize that I can’t be like anyone else, all I can do it be me. You know what? That’s more than enough. 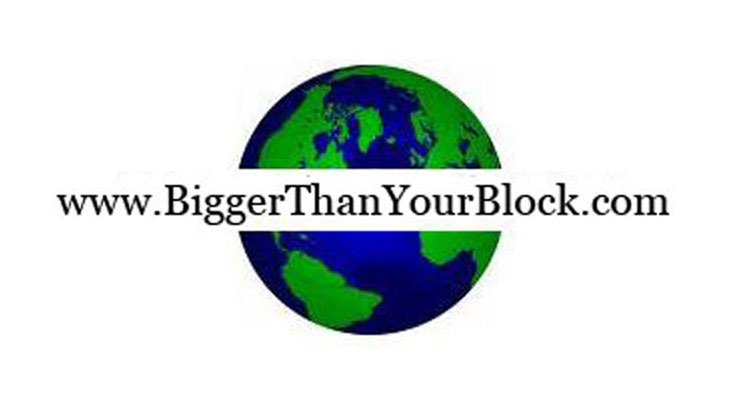 I developed the concept for Bigger Than Your Block by realizing that there are thousands upon thousands of people that were just like me. They wanted to know more about personal finance, but they didn’t understand all the jargon and they didn’t have anyone to explain the concepts of personal finance simply. I set out to help the average person without $20.000 to invest or without the background in personal finance to be able to understand and apply the basic concepts that will help them make small changes that make a big difference. I started with $100. All I had was the internet, a website (that I built), my contacts, and a lot of moxy. I created a flyer, set up my website, and started letting people know that I was open for business. I spoke on a panel for a nationally acclaimed documentary and the University of Southern California the year I opened up shop. I only use independent contractors. My biggest issue is keeping inventory moving. It’s a struggle to make sure that I’m ordering and shipping enough to schools, but not keeping too much in stock because that’s money going to waste. I get the most joy from seeing the difference that I’m making in the lives of people. I love having people that read my books and hear my workshops, etc. send me emails and tell me that they were able to save money, start saving for retirement, or earn compound interest from the strategies and tips that I provided. I love being able to help people reach their financial goals. I’m horrible at balancing work and family life. I’m fortunate that I have an awesome, supportive family that is willing to work with my shortcomings. Figure out what you want to speak about, what you feel comfortable speaking about, and stick to it. It’s best to be know as a leader in your specific, small, field than to be know as “just another one” in a large field. One winner will be chosen Friday, September 3rd.